The winter offshore season in the Galapagos Islands includes a huge influx of yellowfin tuna including many fish in the 80-150lb range. 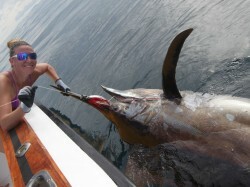 We fish with the Sportfish Galapagos charter operation and they have become quite good at locating the best action in the waters off of San Cristobal Island. Stay calm and be patient! Wait for the right moment to make your cast. Too often anglers throw without knowing exactly where the fish are or before they are in range. Visualize your cast from back cast to follow-through. Make sure nothing (including other anglers) is in your way. Practice several casts so that you know exactly how much distance you can get. Slow your retrieve down to where you have maximum splash and minimal forward motion. 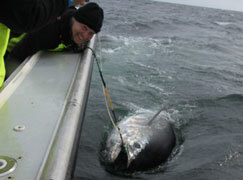 It is a common misconception that lures need to be retrieved quickly for tuna. Set the hook. A common mistake occurs when the angler just starts fighting the fish after the strike. A reasonable hook set will give your plug a better chance of staying in the fish. Cast with a loose drag! 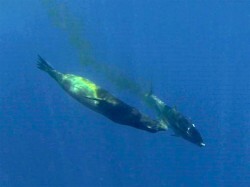 Big yellowfin tuna hit with incredible speed and the initial force of the strike can overwhelm your connections and break the fish off. Loosen your drag before casting. Fight with a heavy drag. Know the limits of your outfit, line, and connections and fight the fish at around 90% of your maximum drag. Cup the spool. Learn how and when to cup the spool especially in the later parts of the fight. 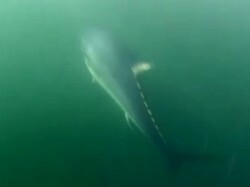 Tuna circle when hooked. Lift and take line on the half of the circle that benefits you. 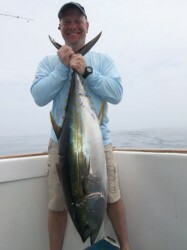 Limit the tuna’s ability to get that line back on the other half by gently cupping the spool. Be careful! This takes a lot of practice and is not easy. Unless you are 100% confident, don’t do it!